Sure, we’ve all seen Toy Story and Buzz Lightyear’s continued attempts at flight. We all know that the wings on his back will never allow him to achieve flight in the functional sense. He has no ability to flap or twist his wings to produce lift or thrust, nor does he have engines like an airplane to propel him through the air. Instead, he can only use his wings for stability, and to add style to his fall. When he finally manages to engage in a prolonged flight he calls it “falling with style”. In reality, he is not very far off. 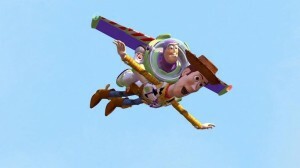 Buzz finds his ability to glide, an action that essentially is a fall, a controlled fall, but a fall nonetheless. Buzz Lightyear "falling with style "
An animal, or object, that is truly gliding is in a descent, thus falling, at an angle closer to the horizontal than 45 degrees. So how can a mammal sustain this action? How can a mammal maintain a constant descent while traveling very close to a horizontal path? The animal must have developed a wing of sorts, something to counteract the force of drag while falling, something to produce enough lift to control the descent of the animal. This “wing” is called a patagium. The patagium is a flap of skin that extends between the forelimbs and the hind-limbs, acting as a wing. This structure plays the biggest role in allowing mammals to glide from one point to another. The patagium is a wing-like flap of skin connected to the fore- and hind-limbs of gliding mammals. So this is all pretty neat, some mammals have this weird flap that allows them to fly short distances, but how does it actually function? Well, there are aerodynamic forces that play a role in this method of flight. While birds can use their wings to produce thrust and forward motion, as well as lift. Gliders can only use their patagium for lift and their thrust comes from their jump off a tree branch or other place higher than their destination. This means that the patagium must produce a force of lift great enough to overcome the force of gravity on the weight of the mammal as well AND great enough to counteract the force of air resistance, or drag, on the animal. This photo depicts the 3 forces on a glider, thus the 3 forces on the patagium of a gliding mammal. The size of the patagium will depend on the distance to which the mammal has adapted to flying. The colugo, for example, can travel up to 70 meters in the air, so it’s patagium utilizes the greatest amount of space possible, stretching from the shoulder to the tip of the fingers, down to the tip of the toes, and all the way up the hind-limb. This allows the animal to generate plenty of lift to overcome the increasing drag as its velocity increases in the “fall”, or glide. Mammals in flight are merely “falling with style”, using their patagium for stability and lift. This allows them to travel through the air without losing significant altitude or control. Awesome comparison to Buzz Lightyear’s falling with style! You wrote a really eye catching post that was very enjoyable to read. By connecting the aerodynamic forces of gliding to something like falling with style you were also able to make your subject very understandable.